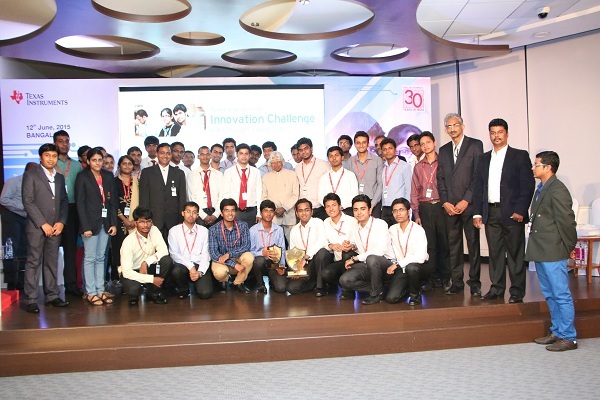 Robots, radars, smart-sensing devices, solutions for boosting agricultural productivity and assistive devices for the differently-abled were among the projects demonstrated by engineering students during the finals of the Texas Instruments Innovation Challenge (TIIC) India Design Contest, held at the Texas Instruments (TI) Bangalore campus. More than 80,000 engineering students from across India have participated in this contest through the past 6 years with the aim to solve real-world problems and create lasting social impact. Former President of India, Dr. A.P.J. Abdul Kalam, graced the finale of the contest at the TI campus and spoke about his vision of Innovation as a key to national development as the audience listened with rapt attention. The ceremony concluded with the ‘FMCW Radar for 3D Automotive Imaging’ project by the students of MS Ramaiah Institute of Technology, Bangalore being declared the winner of the India Texas Instruments Innovation Challenge Chairman’s award. “The TIIC is a platform to showcase the innovative projects of aspiring engineers. We mentor students in engineering colleges for a year and equip them with the latest analog and embedded processing technologies to bring their ideas to life. This helps students build an understanding of technology and nurture their passion for solving real-world problems.” said Sanjay Srivastava,Director – University Program, Texas Instruments India. Sanjay spearheads the TI India University Marketing program that has helped set up nearly 2400 teaching labs across 1800 engineering colleges, thus far. In 2014 alone, more than 340,000 engineering students have benefited from technology-based training through TI’s university marketing program in India. Celebrating its thirty years in India in 2015, TI continues to thrive on its core values – Integrity, Innovation and Commitment. “The innovation challenge fosters a culture of innovation among engineering students by enabling students to apply the latest technologies to create social impact,” said Santhosh Kumar, President and Managing Director, Texas Instruments India. Established in 1982, the TI University Program is a global program dedicated to supporting educators, researchers and students. It facilitates the inclusion of TI analog and embedded processing products in engineering classrooms; teaching and research labs; textbooks; design projects; and course curricula. By building relationships with educators, TI works to bridge the gap between the business and academic world. “The worldwide TI University Program is the intersection between TI technology, educators and the engineers of tomorrow. Our advanced analog and embedded processing technologies fuel the passion of students and educators in university labs around the globe.” said Douglas Phillips, Worldwide University Marketing manager, Texas Instruments.